Sleep is one of the most vital needs for babies and children. It is the primary activity of the brain during early development and plays an extremely important role in the mental and physical growth of little ones. Every child is different and sleep needs change as babies grow older, so there’s a lot to know about children and sleep. The variety of information available and common myths can make it a challenge for parents to navigate this topic. What sleep patterns should I expect for my child or children? How much sleep does a baby need? Or my child? How can I know my child is getting the right amount of sleep? The first step in understanding your baby or child’s sleep needs is to learn the recommended sleep requirements for children at different ages. The Ultimate Children’s Sleep Chart below outlines the ideal sleep time by time of day in various age ranges for children from newborn to 12 years old. The chart also includes helpful tips for each age group to help parents ensure they are promoting healthy sleep habits. Many factors can contribute to frustrating and challenging bedtime experiences with children. Whether a parent is trying to soothe a fussy baby with colic or reason with a toddler who keeps jumping out of the crib, a sleep routine is key in making bed and nap time easier for everyone. According to a radio story on NPR.org, children with irregular bedtimes are more likely to have behavioral issues than kids who have regular bedtime routines. Establishing bedtime routines as early as possible can help children learn healthy sleep habits at an early age, and it’s up to parents to create a structure, consistency, and rules. Follow this step-by-step guide to setting up you and your child or children for sleep success. Pick an appropriate bedtime and stay consistent so your child can get the right amount of sleep based on his or her age and learn what to expect. You can design your bedtime routine to be what works best for you, your child, and your family. Newborns and babies will have a more flexible routine while you’re still learning their patterns of feeding, playing, and sleeping. Toddlers and children can have the ability for a very structured bedtime routine. Whatever you choose, consider making it enjoyable and calming. Keep pre-bedtime activities consistent; you can start the process before bedtime even starts (example: play relaxing music an hour or 30 minutes before bedtime). Before you tuck your little one in bed, ensure the room environment is safe and is the correct temperature, has appropriate lighting, and your child’s sleeping attire is right for his or her age. Setting up an appropriate and healthy sleeping environment is key in helping parents provide the opportunity for their children to get the right amount of sleep. From a baby’s crib or a child’s mattress to pillows, bedding, and lighting, all of these components help make up a sleep habitat for children. There are so many elements to consider, so we’re breaking it down for you right here. Read each section to learn a little bit about the key elements and tips to create the right environment for your baby or child. First thing’s first when it comes to a sleep environment: you must have a good-quality and safe mattress for your baby and child. New parents are usually really excited about getting a cute crib — we all know how fun it is to decorate a nursery. However, the most important part of nursery and the crib is actually the mattress. 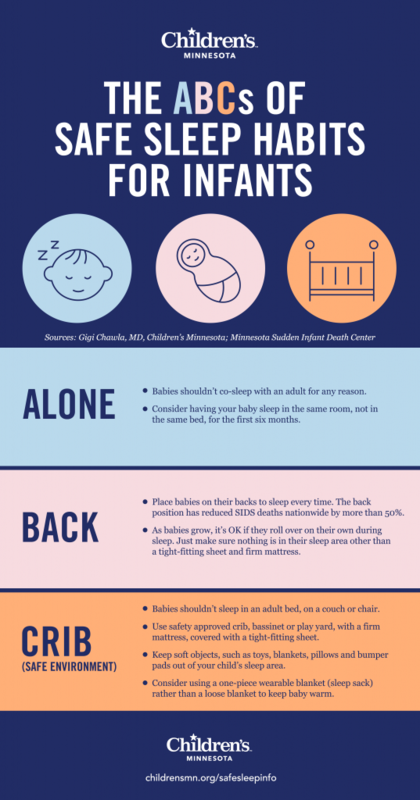 This infographic and video by The Center for Injury Research and Policy demonstrate the importance of a safe crib in creating a safe baby sleep environment. Two key things to look for when selecting a crib mattress are firmness and fit. Some parents use the “two finger test” to ensure the crib mattress has the correct fit. What’s a crib mattress made of? Innerspring: firm, durable, heavy (around 15-30 pounds) because of the many layers of material (coils, foam, padding, fabric) used. Foam: durable and lightweight (around 5-13 pounds), easy to move for cleaning/changing sheet, less springy and can come in several thicknesses. Organic: environmentally friendly or sustainable innerspring or foam made with all natural materials, which can include wool, cotton, plant-based foam, coconut fibers, etc. Dual firmness convertible: for cribs that will convert to toddler beds with a very firm mattress on infant side and a foam more cushiony side for the toddler. What’s best for my baby? Choosing a mattress can be difficult. Above all, selecting a firm mattress with the right fit for your crib is the best scenario for newborns and infants. Will your crib be convertible? How heavy of a mattress do you want? Do you prefer one kind of mattress material over another? What will your baby’s transition from a crib to a toddler bed look like? According to Parents.com, it’s appropriate to move a baby to a toddler bed between 18 to 24 months and when your child is ready for the transition. According to Consumer Reports, a manufacturer warranty for a mattress isn’t the most important part of making a mattress last. Modern mattresses on the market today should keep their shape and support. Keeping a crib mattress clean and stored well when not in use will help extend the life of a mattress. How do I keep a crib mattress clean? Use a washable or waterproof cover over your crib mattress to protect the mattress and wipe down the crib mattress or spot clean with soap and water after leaks occur. The waterproof cover goes under the sheet layer and can be easily removed for washing. Time for graduation to a big kid bed? Once your little one is ready for a big kid bed, it’s time to make another decision about your child’s sleeping environment! Size, material/type, cost, style for sleeping position, and bed frame details are some areas to consider. Based on the size of your child’s room, you will likely be considering a twin or twin XL. But, if the room is big enough, you may want to consider a larger size like a full size mattress. Now that your child is old enough to be involved, make picking a new mattress and bed an exciting adventure. Watch this video from Consumer Reports on testing mattresses. What kind of mattress should I buy and why? Memory foam: softens and molds to the body and returns to original shape. Shapes to the body for real comfort and may be good for keeping sleepers in a consistent position, as it takes effort to change positions throughout the night. This could be a good option for side or back-sleeping needs. Innerspring: traditional mattresses with layers of cushioning and springs. Least expensive, the most widely used, a range of firmness levels and some have pillow tops for added comfort. These mattresses could be good for easing the shifting of positions while sleeping. Adjustable air: air-filled chambers are covered with a foam layer and can be inflated to a desired firmness with an electric pump. Made more for people who sleep with a partner and can be flexible by firmness level adjustment for each person. Latex: made from natural or synthetic rubber. Firm and comforting and a good choice for those who like firm mattress. Similar to a memory foam mattress feel but with more support because there’s not a body molding element involved. What sleeping position is best for my child? There are the 4 most common sleeping positions, but back sleeping is the most recommended for babies, toddlers, and older children. How much will a mattress cost? There are lots of choices! Consider your budget and have fun shopping. Pillows are meant for making sleep more comfortable. Until your child is old enough, it’s recommended that you wait until your child is ready to introduce pillows. Pillows that are soft but still firm are the best kind of pillows for kids, because they provide enough support but still provide comfort. What pillow is best for different sleeping positions? Kids bedding can be really cute and stylish in a nursery or kid’s room, and it’s really important to choose the appropriate bedding for your child’s age and safety regardless of style. The recommended bedding for baby sleep consists of a mattress pad cover and a fitted crib sheet. It’s important to have plenty of covers and sheets available, because you’ll need to change baby bedding quite often. Toddlers who have graduated from the crib to a toddler bed can sleep in pajamas with feet or sleepers. Once your toddler graduates to a big kid bed, it’s ok to introduce light bedding and a soft and firm pillow. It’s a great opportunity to go shopping with your child and have fun in picking out a new set together. Lighting has an impact on sleep for both babies and children. For the first few months, infants are still developing and learning about the difference between day and night. So, allowing them to experience light during the day even if they are napping, and nighttime dark at night, is the best way to promote nighttime sleep. It’s a good practice to keep the baby’s room dark and quiet at night to help inspire healthy baby sleep. Use very little light when entering the baby’s room so you keep the nighttime environment consistent. The National Sleep Foundation says exposure to light keeps us awake and can prevent a good night’s sleep. The same goes for babies and children, so a dark room is best for everyone to have healthy sleep. Should I use a night light? Sleep can sometimes come with some challenges for babies and children. We’ve looked into the most common sleep issues for children. Here’s a guide that describes what each condition is and how it can be helped, plus some resources for more information. To learn more about these sleep issues, see our Guide to Sleep Disorders. Restless leg syndrome, although more common for adults that children, is a medical condition in which children feel an uncomfortable and irresistible urge to move their legs. This condition usually happens at bedtime, and subsides when children fidget, stretch, walk, rock, run, and change sleep positions. There are no specific tests to for RLS, but a diagnosis can be based on symptoms. The syndrome can cause sleep deprivation which can cause children to be moody, irritable, drowsy, or hyperactive and have behavior issues. Nightmares and night time fears are dreams that wake children up during sleep that causes terror, fear, anxiety, or distress. Nightmares are part of normal development for children and are very common. Nightmares are most common in the preschool years, but can also affect children and older kids, too. Insomnia is when children have difficulty falling asleep or staying asleep. The condition is fairly common and affects about 25% of kids, and can be caused by stress, anxiety, pain or a mental health issue. There are two kinds of insomnia: sleep-onset-association for kids younger than 5 years old and limit-setting insomnia for kids older than 5 years old. Identify the issues that cause stress or anxiety like homework, friends, etc. Sleep apnea, common in children today, is when a child snores, has pauses, gasps, snorts and may stop breathing. These pauses may wake up children and disturb their sleep. They may also appear restless and sleep in abnormal positions and sweat heavily. This can cause behavioral and social issues and cause children to be irritable and difficult during the day time. Sleep or night terrors are similar to nightmares, but they are much more dramatic and include screaming, flailing and intense fear. 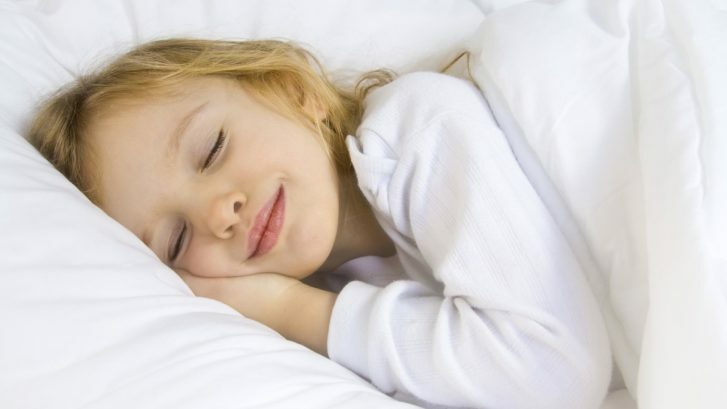 Children experience a dream during the transition from one part of sleep to another. Sleep terrors are fairly rare and occur for a few seconds to a few minutes, and affect children between 3 and 12 years old. Sleep terrors can be caused by fatigue or a lack of sleep, stress, illness or fever, a new sleep environment, noises or lights, or a full bladder. Snoring, which is very common in most children on occasion, occurs because there is a blockage of air passage to the throat. The loud noise is caused by the vibration of throat tissues. Although snoring on occasion is normal, regular loud snoring is not and could mean the child has some kind of infection. When snoring causes gasping and breathing pauses, the child could have sleep apnea. Sleepwalking is a disorder during sleep that causes a child to walk or perform other behaviors during sleep, like walking around the house or leaving the house. It is much more common for children ages 4 to 8 than adults, and sleepwalking can run in the family. Sleepwalking can also be in conjunction with sleep terrors and sleep talking. Sleep talking is common behavior among kids ages 3 to 10 years old. It is a behavior that occurs during sleep when a person talks or mumbles and isn’t aware of the experience. It is not a dangerous condition, and each episode only last about 30 seconds. It can also happen during sleep terrors and sleepwalking, but on its own is not a threatening condition. How can I teach my child about healthy sleeping? Healthy sleep habits are paramount when it comes to your child’s development and growth. Teaching your child why healthy sleep habits are so important can be fun and rewarding. Kids love to learn, so take advantage of your eager child and think about the best ways to approach him or her with lessons about healthy sleep and bedtime routines. There are many topics we’ve reviewed in this guide, but here are a few key topics that you can review with your child to ensure he or she has an understanding of what healthy sleep means. What happens to the brain while we sleep? Sleep is so important for brain function, and it’s important to teach children how the brain works. Dreaming is a natural part of sleep and kids will want to learn more about it, as they will experience dreams throughout their growing up and adult lives, too. How do I get enough sleep? Getting the right amount of sleep is key in living a healthy life. Kids need a certain amount of sleep and that changes as they get older. Start by showing your child a chart that shows the amount of baby sleep needed and sleep needed as the baby grows older. Check out these sources for more information on specific topics, plus our favorite children’s books and lullabies. Parents.com is a reliable resource with many easy-to-read articles and slideshows with tips on Baby Sleep Training basics, Teaching a Baby to sleep in 7 days, 5 Sleep Through the Night Strategies and more. WebMD is a great source for learning about all-things-baby. Each article does a great job explaining the basics of each topic and then offers quick and scannable bulleted lists with explanations and tips. Mayo Clinic is a great resource for parents on any health (mental or physical) related topic for babies and children. Each article is easy to read and gives excellent details regarding each topic, like exact hours or ages.and suggestions for creating healthy habits. The American Academy of Sleep Medicine is a good resource for learning more about sleep aids. The organization provides a resource library. American Family Physician offers information on a range of topics from A to Z and provides detail about the disorder or condition, along with information on treatment, plus additional information. National Sleep Foundation is a prime source for information on everything regarding sleep, and has a wealth of information on sleep disorders, too. Sleepeducation.org is a great place to find information on topics by category and name. It is easy to navigate and has articles that are quick and easy to read. Stanford Medicine has a Center for Sleep Sciences and Medicine, and the website has a whole section on sleep disorders. Each article talks about the disorder and offers treatments and solutions for solving the problem. The National Institute of Health has a lot of information on sleep studies and the different kinds of studies that are performed to learn about, diagnose and treat sleep-related problems. Johns Hopkins Medicine is a source for information on sleep studies and what they entail, and also has a library of information on topics by keyword that’s really easy to use. Cleveland Clinic for Children’s Health has a great site with tips for helping kids choose and create healthy sleep habits. PBS Parents is a good resource to learn more about specific issues related to babies and toddlers and how to improve habits and lifestyle. The University of Missouri’s website offers great material on sleep habits, routine and problems. Plus, they have a link for more reputable sources. We couldn’t help but include some of our favorite books and lullabies for helping put your child to sleep. Enjoy!